Every Canadian adult (18 or 19 years old, depending on the province) will be able to purchase cannabis on the internet starting Oct. 17 via government-controlled websites. However, those wanting to walk into a physical bricks-and-mortar retail location for their cannabis fix will find the experience vastly different depending on where they live in Canada. Below, BNN Bloomberg breaks down how every Canadian province and territory is planning to handle legal marijuana sales. The only province east of Manitoba that will allow private businesses to sell cannabis, Newfoundland expects to have 24 stores operational on day one of legalization. Many are expected to be located adjacent to grocery stores that already contain liquor stores, but still physically separate. Smiths Falls, Ont.-based Canopy Growth Corp. (WEED.TO) will be the province’s main wholesale cannabis provider, but the company will also operate four physical retail locations via its Tweed subsidiary. The Nova Scotia Liquor Corporation was originally going to open nine government-owned stores across the province the day that a century of cannabis prohibition came to an end. That changed after Statistics Canada published data showing residents of that province consumed the most cannabis in Canada on a per-capita basis. Now the plan is to open 12 retail storefronts by mid-October. Already boasting completed designs for its network of 20 “Cannabis NB” locations, New Brunswick is arguably further ahead with its marijuana sales plans than the rest of Canada. The province was already planning to have every store stocked and staffed by July 1, suggesting they should have no problem being ready for mid-October. Canada’s smallest province by population (and by physical size) is planning to open four stand-alone cannabis stores on Oct. 17. While that figure might seem low, that works out to one store for every 35,000 Islanders. Each retail location in Quebec and Ontario, by comparison, will be serving roughly ten times as many residents. Despite being Canada’s second-largest province by population, Quebec intends to have the same number of cannabis retailers open in the early days of legalization as neighbouring New Brunswick (which has less than a tenth Quebec’s population). Those 20 pot stores will each be serving roughly 408,000 Quebecers. 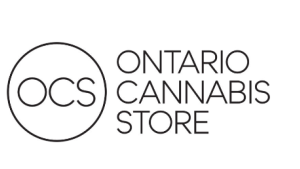 The logo for the Ontario Cannabis Store. The Ontario Cannabis Store, a subsidiary of the provincially-owned Liquor Control Board of Ontario, is planning to open 40 stores by the end of 2018. However, it is unclear whether all 40 locations will be operational by mid-October, as just four locations have been announced thus far, including one in the Greater Toronto Area. Even if all 40 OCS locations are ready by Oct. 17, that would still equate to one store for every 338,000 Ontarians. The goal is to have 150 Ontario Cannabis Stores province-wide by 2020. Lauded by industry players for its hands-off approach to cannabis retailing, four private consortiums won the right earlier this year to sell cannabis in the geographical centre of Canada. Canopy will be partnering with Winnipeg-based Delta 9 Cannabis for one network and medicinal marijuana information provider National Access Cannabis will operate another. Tokyo Smoke – a Toronto-based startup founded by former Google executive Alan Gertner – will be the third retailer and the fourth is a numbered corporation comprised of Manitoba and Ontario First Nations, Ontario-based MediPharm Labs and U.S.-based retailer Native Roots. All told, Manitoba is expected to have well over 100 cannabis retail locations stocked and staffed by the fall. Fifty-one private retailers across the central prairie province were granted licenses to sell recreational cannabis earlier this year. Licensees run the gambit from large producers (Canopy’s Tweed Grasslands unit won five licenses), to First Nations communities and even to one 23-year-old recent University graduate who will operate a store in Saskatoon called “Living Skies Cannabis”. In keeping with the province’s comparably lax regulatory regime for alcohol, Alberta is leaving physical cannabis retailing entirely in the hands of the private sector. There is no limit to the total number of licenses the recently-renamed Alberta Gaming, Liquor and Cannabis Commission is willing to issue, mandating only that no single entity be allowed to control more than 15 per cent of all cannabis retail licenses. As of late April, the AGLCC had received 452 completed applications to open recreational cannabis stores. Departing slightly from the rest of western Canada, B.C. is opting for a mix of both public and private cannabis retail outlets. The government will be the sole wholesale distributor of marijuana to both public and privately-owned locations, but owners of B.C.’s vast network of still-technically-illicit dispensaries will be allowed to apply for permits once prohibition formally ends. The City of Vancouver started issuing business licenses to some of those dispensaries two years ago in an effort to rein in the grey market. Roughly two dozen have been granted semi-legal status since then. The territorial government is planning to open a single cannabis retail location in the capital of Whitehorse by the time legalization takes effect. Yukon has a population of roughly 36,000 people, meaning the ratio of stores to residents will be roughly the same as that of Prince Edward Island. The only jurisdiction in Canada that doesn’t seem to mind having cannabis sold in close proximity to alcohol, the Northwest Territories plans to initially have seven government-owned liquor stores in six communities selling legal pot. According to the legislation passed in Yellowknife in late May, the territory will consider licensing private cannabis retailers six months after legalization takes effect. That means liquor stores in the NWT can only expect to enjoy a brief monopoly on marijuana retail. Canada’s youngest territory is also the only jurisdiction in the country with no plans for any physical cannabis retail presence, leaving its 36,000 residents with only an online option. Nunavut has a long history of preventing bricks-and-mortar intoxicant sales of any kind, having gone nearly 40 years without an alcohol retailer until 2017 when a single beer and wine store opened in Iqaluit.